It’s been a century since Sun Yat-sen was named president of the new Republic of China. Unfortunately, he was president for less than six weeks and spent most of that time negotiating the job away to Yuan Shikai. Trusting Yuan Shikai to nourish a fragile young republican government was akin to dousing a three-year old in A1 Sauce and putting him in the care of a rabid honey badger. But the conclusion of a well-contested and still (reasonably) civil election in Taiwan, won by the party Sun founded, makes me wonder whether the calamitous disintegration of China’s first republican experiment 100 years ago was inevitable. There were always going to be challenges, and the fractious nature of Chinese society meant knitting together a nation based on a shared commitment to republican ideals would be a herculean task, but Sun had help. The young organizer Song Jiaoren, a trusted lieutenant of Sun’s, worked tirelessly to build a national party capable of winning a majority in the yet-to-be-seated national assembly. 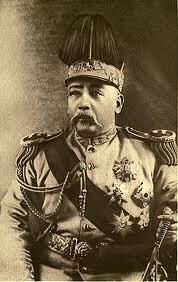 Unfortunately, Song was assassinated less than a year later by agents of Yuan Shikai. Yuan then dissolved parliament, outlawed opposition parties, and watched a “Second Revolution” launched by Sun in 1913 founder and fizzle. After Yuan’s death in 1916, what was left of central authority crumbled and the old Qing Empire became a failed state, a patchwork of warlords and occupying powers. Sun and others argued that the political consciousness of China’s people was too limited to support the kind of popular participation required in a republican government. Sentiments still echoed today. Most recently, Han Han, the Justin Bieber of China’s literary world, posted a series of provocative essays conceding that even a century later, Sun’s assessment of the political potential of China’s populace was essentially nil. Frankly, I find the argument that Chinese people are “too base” for democracy a little dismissive and patronizing. But while it can be tiresome when my urban middle-class Chinese friends resort to the “suzhi” argument, I have little patience for foreign ‘friends’ of China playing the same card. When well-heeled urban Chinese make this argument, it’s asinine and classist, but when trotted out by non-Chinese commentators, most of whom grew up with a full complement of civil liberties and legal protections, it comes across as not a little bit racist as well. 100 years ago, Sun famously compared Chinese society to a heap of loose sand, 400 million individuals who needed to be awakened so as to play a part in the forging of a new nation based on republican principles and rule of law. A century later, Sun’s vision has come true – if not for China as a whole – than at least for the people of Taiwan. Whatever can be said for the ‘suitability’ of democracy as a political system, in China or elsewhere, at least we can stop the lame excuses of ‘national condition’ or ‘cultural compatibility’ and other worn out essentialist pseudo-arguments.